I was about six years old and had been saving for a week to buy my mom a Mother’s Day card. At that age, all of my disposable income went to sweets and other everyday necessities, like…soapy liquid for bubbles. Because I didn’t qualify for any bank loans, for seven days, I put away money given to me (from my parents) for treats. After relentlessly saving and digging for change wedged in between our sofa cushions, I had accumulated a whopping sum of $3. Now that I had acquired the necessary funds needed to get the card, I had to figure out how I was going to physically buy it. I couldn’t drive to the store or leave the house without a grown-up. This was a problem solving exercise, not unlike the rigorous addition and subtraction work I had been doing at school. I sat down at my little plastic table, illustrating different plans with fat crayons and sheets of paper torn out of my older brother’s black and white composition notebook. But I had nothing. I was getting ready to give up and start on a macaroni picture frame when my mom called to me and asked if I wanted to go to the grocery store with her. Then it came to me. I would go to the store with my mom, sneak off to the card aisle while she picks out produce (because that lady can spend all day picking out a potato). Without answering my mom, I dashed to the garage, my ponytail flying behind me, and strapped myself into the car. I walked along side my mom for a quick escape, instead of climbing into the cart like I usually did. Boy do I miss those cart rides. It didn’t take long for me to find the aisle with all the cards and wrapping stuff, despite not being able to read words with more than three letters. I stood in line at check-out, and being the only person in line under 3 feet, I stuck out like a sore thumb. An older man jumped in line right behind me. I reflexively turned around, and he shot a kind and gentle smile down at me. His gaze went to my mother’s day card, lying flat on the belt, and he asked, “Is that card for your mom?”. I bashfully nodded yes, and then it was my turn to pay. The cashier scanned my card. I can’t remember the exact total, but I remember being short by some change. My eyes widened in a panic, and my heart began to race. I had $3 in my hand, and that was all I had. When I didn’t look up from my feet after what felt like hours to me, the old man next to me said, “Don’t worry, I’ll help you out”. I looked up, confused, but incredibly touched by this kind stranger’s eagerness to help me. The cashier handed the card to me, and I grabbed it with care, not wanting to bend the edges. I graciously thanked the old man, before waltzing off to find my mom. Our interaction was very brief, but years later, I still appreciate what he did for me! 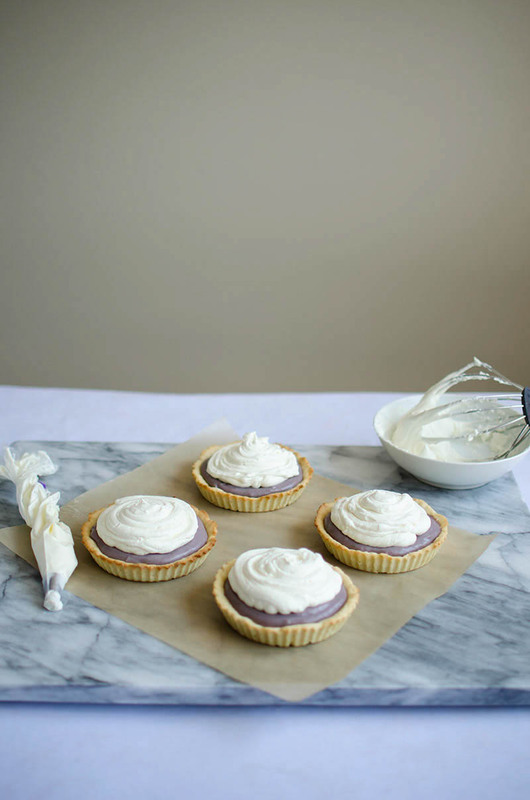 Because Mother’s day was yesterday, I made this very special lavender custard tart with honey mascarpone cream in honor of Mama Choi – the beautiful woman who, with my dear papa, raised my siblings and me with so much love, attention, and care – and Mama U, who brought up four handsome, bright men (one them is currently my boyfriend!) and welcomed me into their loving family from the very first day. 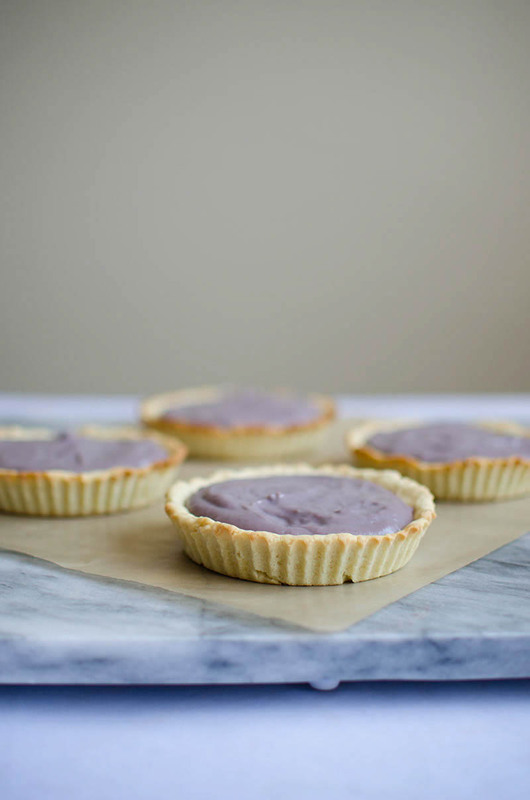 The recipe is adapted from my Chai Vanilla Tart recipe and inspired by a french macaron I had when I was in NYC. 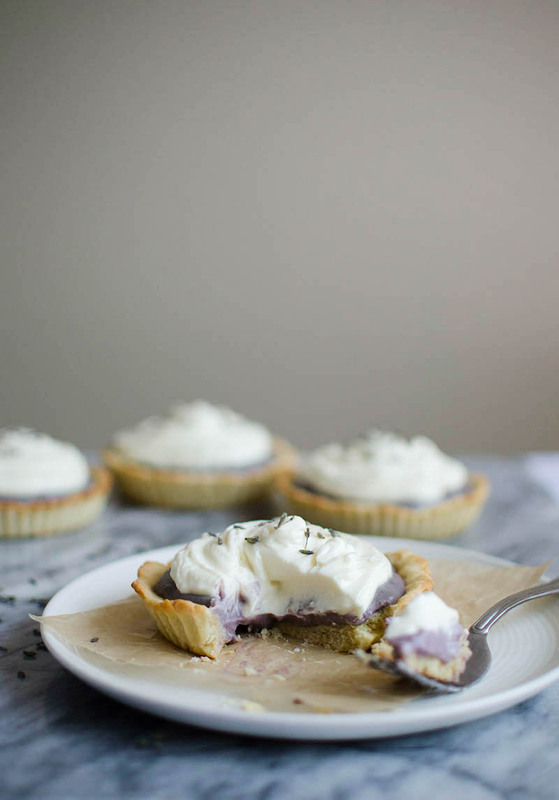 These tarts are infused with dried edible lavender (which I bought from Amazon) and topped with cream made from honey, heavy cream, and mascarpone. The custard is so smooth and fragrant. How wonderful is it to eat something made with such a beautifully scented herb? 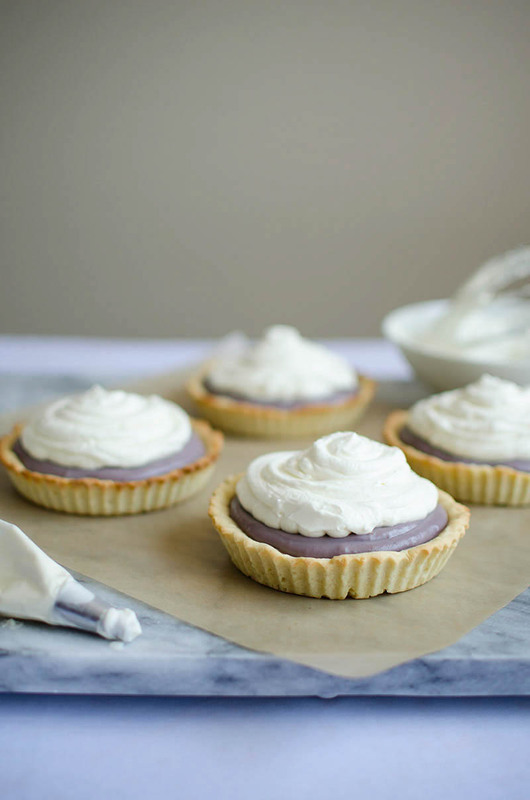 The cream topping is lightly sweetened, creamy and decadent, thanks to the mascarpone. 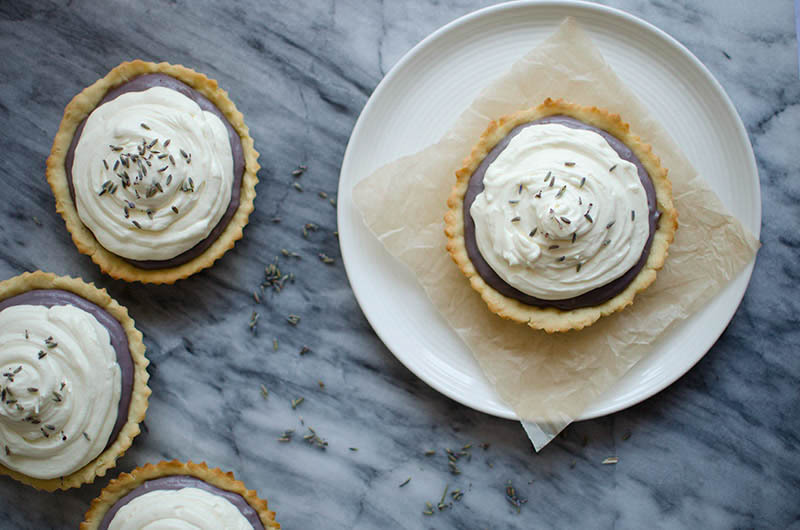 You’ll need to pipe the cream over the tarts. 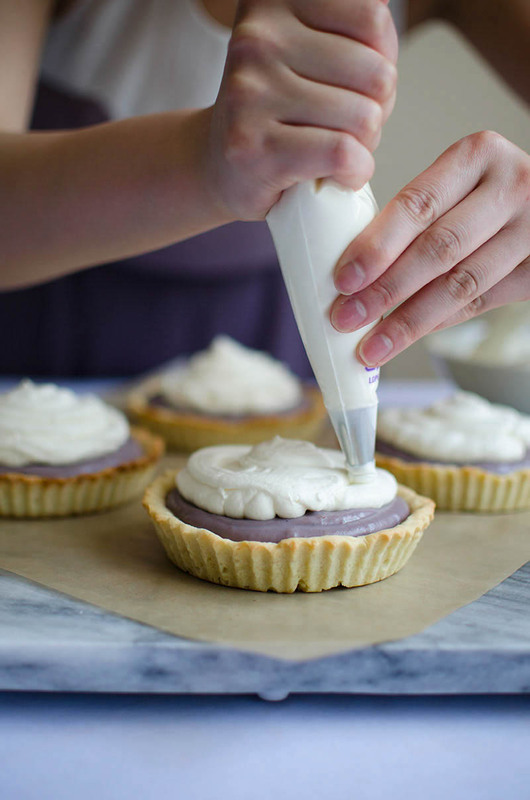 If you don’t have a piping bag, you can use a gallon-size ziplock bag – just fill up the bag with the cream then snip off a corner. 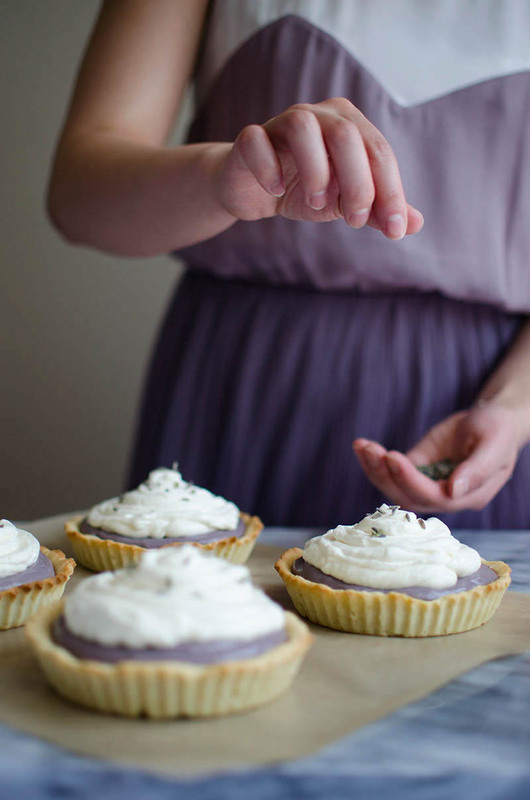 I prefer a more rustic look, so with my piping bag, I made messy circular motions around the tarts when piping on the cream. I used the tip of my piping bag to blend any sharp lines. 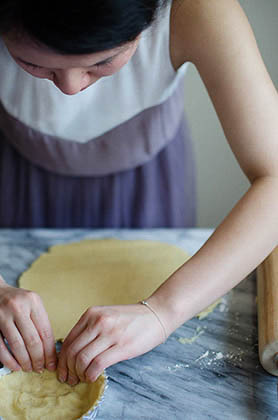 This recipe will yield four 4.75 inch round tarts, or one 4½ x 14 inch rectangle or 9 inch round tart. Lastly, happy Mother’s day to all of the amazing moms! Preheat the oven to 400F degrees. 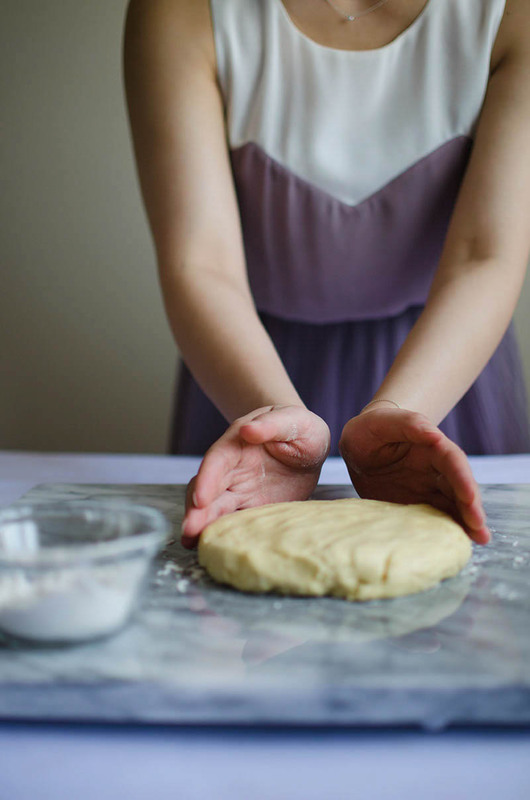 On a lightly floured surface, divide the dough into 4 balls, then roll out the dough, making it slightly larger than the tart pans. 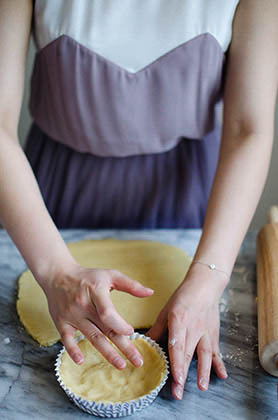 Transfer the dough into your tart pans, fit into the pan, then trim the edges. Line each crust with foil, then fill the pans with dried beans (this will act as a weight). Bake for 10 minutes, until the crusts are slightly golden. 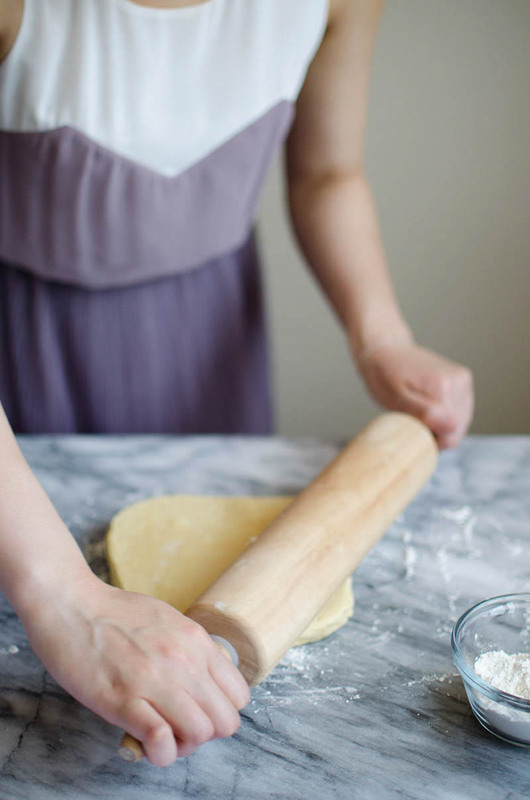 Take the crusts out of the oven, and lower the baking temperature to 350F degrees. Remove the beans and foil, then bake for another 8 to 10 minutes, until lightly browned. Remove from the oven, and place the crusts on a wired rack to cool. In a medium bowl, whisk together the ¼ cup milk, egg, and egg yolks. Slowly mix in the ⅓ cup brown sugar and cornstarch, and whisk until it's free from lumps (pour through a sieve if there are lumps that won't dissolve). In a medium saucepan, heat up the remaining 1½ cup milk and remaining 1½ tablespoons brown sugar over medium heat, and stir to dissolve the sugar. 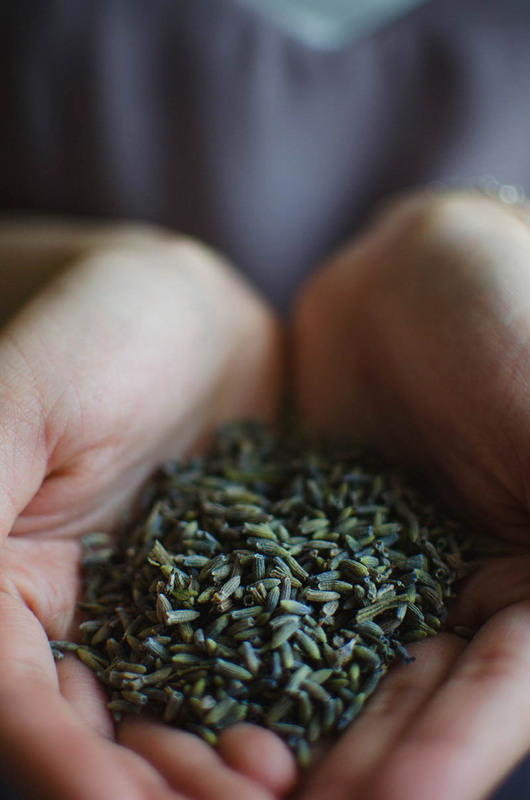 Remove from the heat just before it begins to boil, then stir in the dried lavender. Steep for 5 minutes, then pour through a sieve and discard the lavender. Stir in the food coloring (optional). 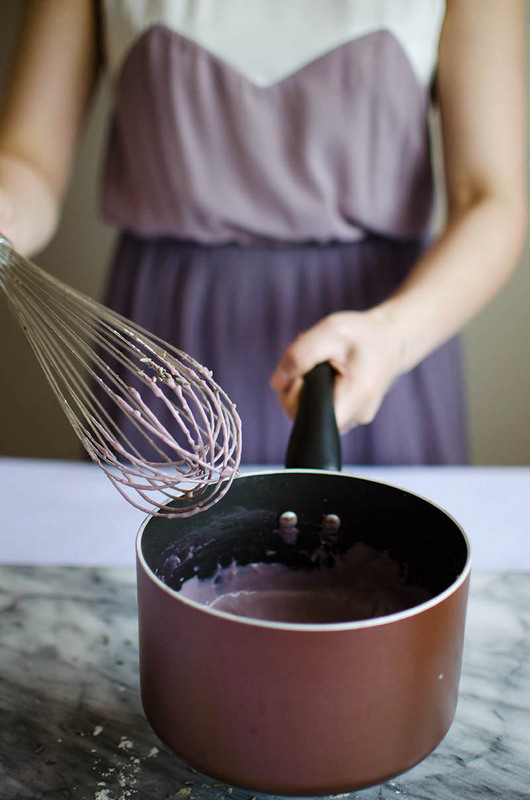 Slowly add ⅓ of the hot milk mixture to the egg mixture, whisking quickly to temper the eggs. Return the tempered egg mixture to the remaining milk mixture in the saucepan and cook, stirring continuously until it reaches a boil. Cook for an additional 1-2 minutes. Remove from the heat, then stir in the butter. Evenly distribute the custard filling into the prepared crusts, then smooth and level with a butter knife or an offset spatula. Place plastic wrap directly on the surface of the custard to prevent a skin from forming. Allow it to cool at room temperature for 1 hour, then refrigerate for 1-2 hours. In a medium size bowl, whip the heavy cream on medium-high speed. Once the cream starts to thicken (about 2 minutes), slowly add the honey. Continue to beat the cream, until smooth and thick, about 3 minutes. Add the mascarpone, and mix on medium-speed until smooth and incorporated. Pipe over the chilled tarts. 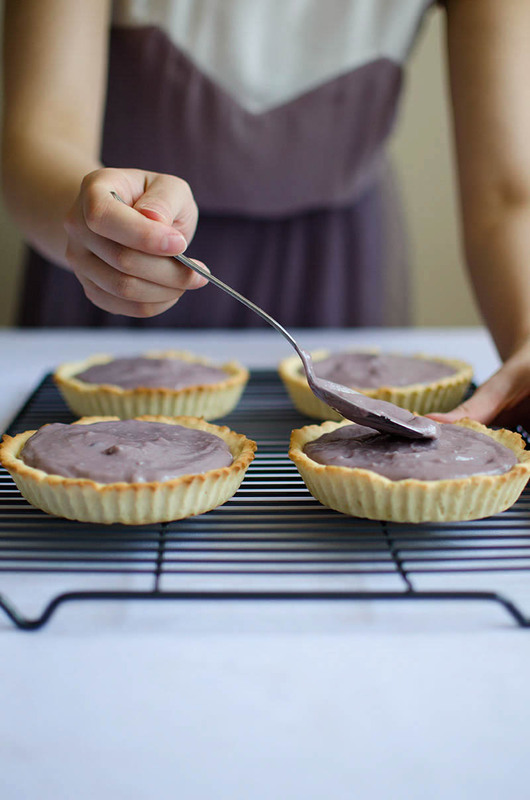 This recipe will yield four 4¾ inch round tarts, or one 4½ x 14 inch rectangle or 9 inch round tart. This entry was posted in Desserts & Sweets and tagged edible flowers, honey, lavender, mascarpone, tart, whipped cream. These look so good, Connie! And I love how your outfit matches, haha. It was such a pleasure to meet you this Saturday at the workshop! So beautiful, and that story captured my heart. The kindness of strangers never fails to astonish me and reaffirm the good in this world. These photos are GORGEOUS darling! Thank you, Rebecca!! You are too sweet!! These photos are beautiful! I love that you wore a purple dress to! 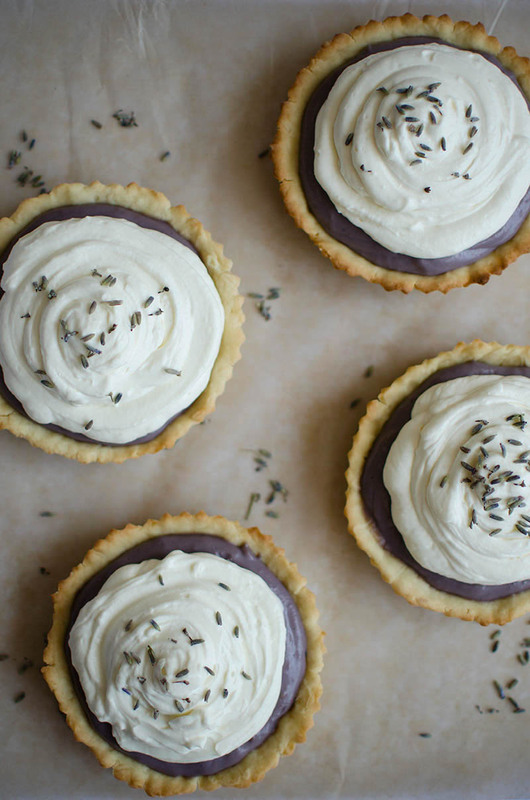 These tarts look delicious. Thank you, Connie, for the Mother’s Day honor! You are even sweeter than this lovely dessert. I can imagine the lavender scent was/is heavenly! 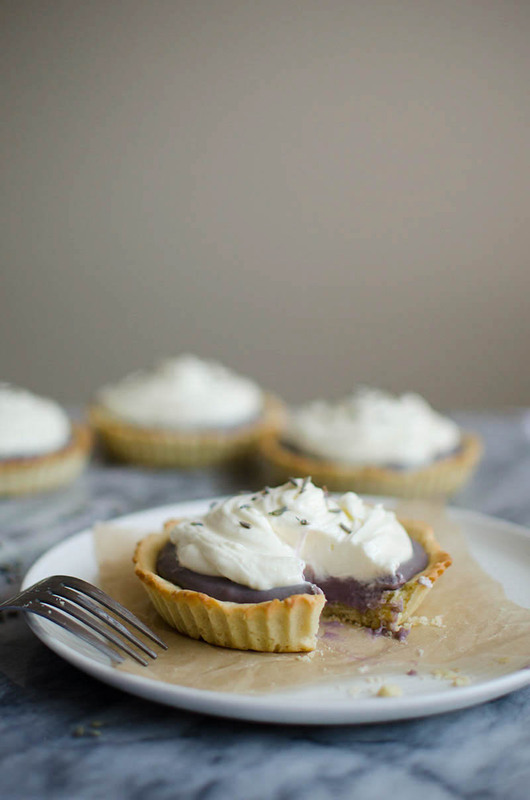 Connie, these photos are stunning and the tart is a work of art. Thank you so much, Nagi! You are so incredibly sweet. Ugh, my heart just shattered to sweet little pieces from that super awesome story! It’s so wonderful that man helped you out and I can imagine a tiny little girl taking that same act of generosity out into the streets. 🙂 And I love lavender! I haven’t cooked with it in months but it seriously adds such a delicious and unique twist to desserts. Thank you, Ellie! You are so sweet! 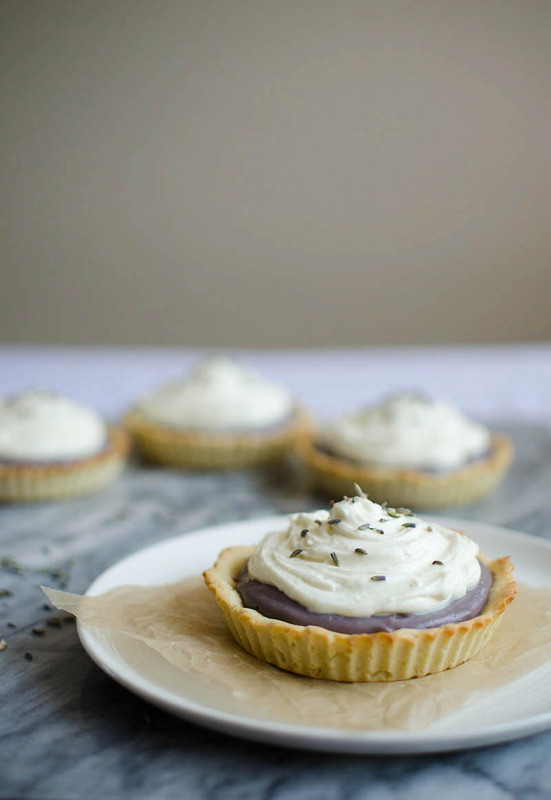 It was first time playing with lavender in cooking, and I loved it so much! It really does add a beautiful uniqueness to desserts. I can’t wait to experiment more! 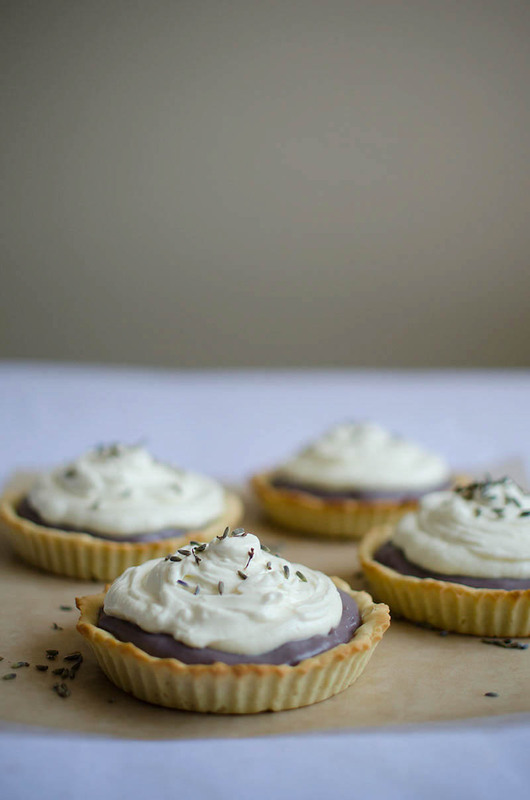 Connie, what a lovely story and beautiful pictures you posted here.Tart looks really delicious. 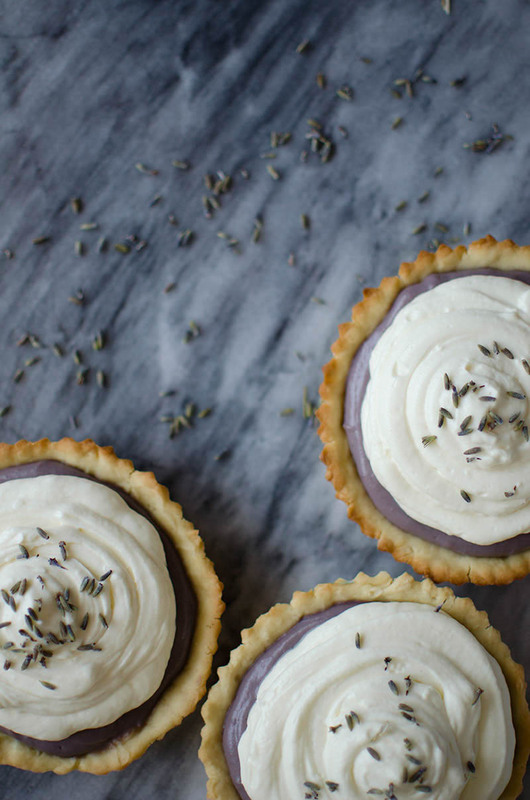 Love the use of lavender. that is such a sweet story! aww little joys and sweet memories, that is what life is all about 🙂 The tarts look gorgeous Connie! love the touch of lavender! I couldn’t agree more – life is all about little joys like that and making sweet memories!! I finally tried to make this tart. I was disappointed that the brown sugar turned everything brown. Why did you specifically say brown sugar? Sorry I put the wrong email address. I used brown sugar because it adds this delicious, rich molasses flavor that I love in baked goods. I am so sorry that it turned everything brown for you. 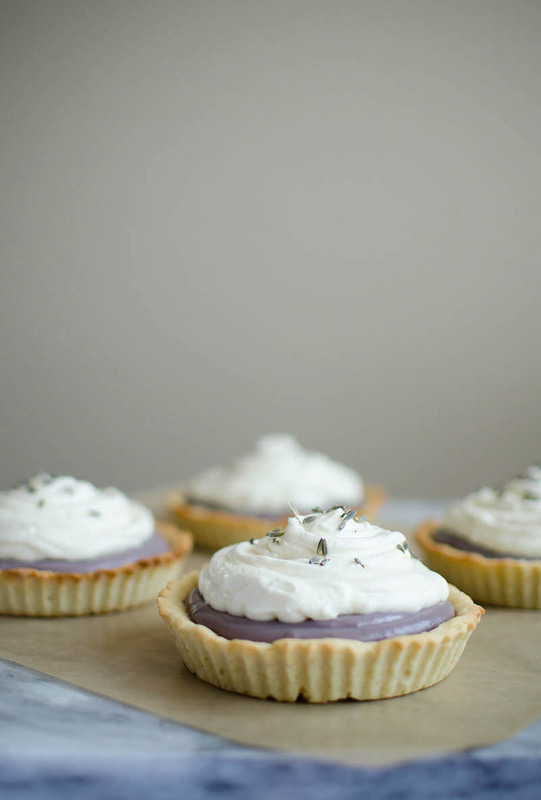 I used a little bit of purple food coloring in my recipe to offset the brown color. 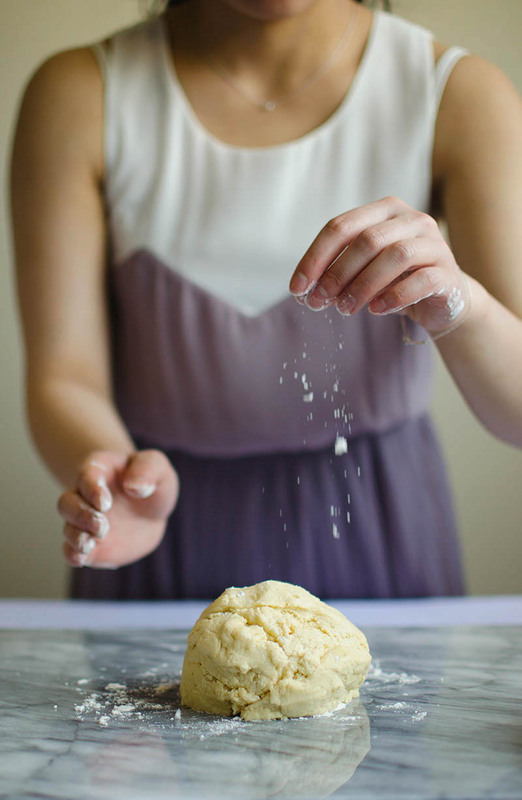 You can definitely modify the recipe to use the same amount of white granulated sugar instead of brown sugar. Thank you so much for writing to me! 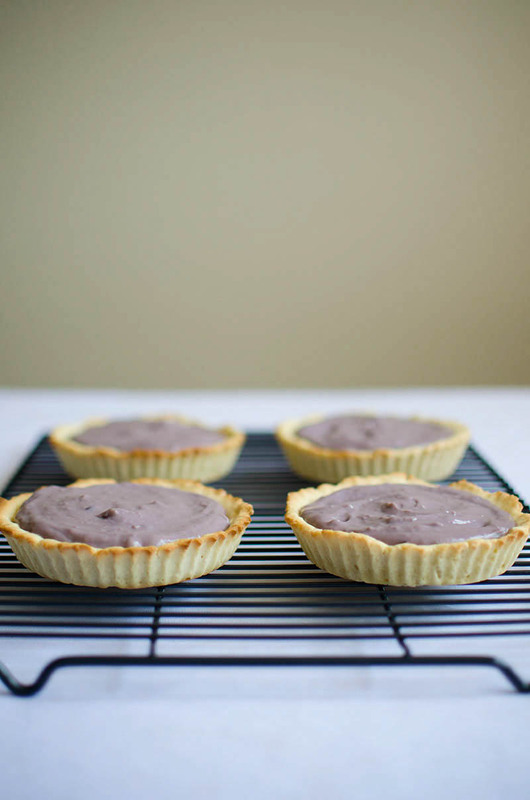 I love hearing how my recipes turned out for others, and I hope the rest of the tart didn’t disappoint! This looks yummy! But, in the ingredients it says 1/3 cup of brown sugar but, in the recipe it only says 1/4 cup? Please Reply… I need for project!